If you want to preserve memories; one of the best ways is through gifts. All special occasions can be made memorable by presenting gifts relevant to the occasion. The gift’s importance increases many times if it’s given without asking. Many appropriate gifts move people to tears - like a gift for your parents from your first salary. That first salary gift makes the day more exciting and the feelings last for as long as life does. If you know a friend who is really stressed out you can help the person out by presenting a gift that he/she was yearning for, for a long time. Gifts have that magic in them to change a bad mood into a happy one. The impact of a gift can be enormous if due consideration and thought is given to it. The gift that you’ve been wanting for your school trip or graduation ceremony, if put before your eyes will make you very emotional and increase the enjoyment of your day. The one who gives the gift will also experience a new high and the memory will be sealed for life. The element of surprise is also a big factor in increasing the joy of the occasion. By ordering online you can give somebody a pleasant surprise. You can have the best gifts from the website of awesomeji.com. It offers a lot of gift options that also at cheap rates. Sweets, chocolates of many kinds, designer jewellery, fashion accessories, beauty products, metal trays with exquisite artwork, brass home décor products, silver plated Pooja thalis, bag planters, image magnets, serving dishes, cutlery set are just some of the things that you can buy or order from the website. The collection of decorative car stands on this website will take your breath away. If you are fond of cakes and someone gifts you a freshly baked cake you will definitely be impressed. To find that special cake go to the awesomeji.com website and allow your close confidant to savour a Limoncello cake, caramelized Apple cake, Tiramisu cake, Carrot cake, Sunken Oreo, Blue Berry, Orange Marmalade, Raspberry, Cinnamon, Apple tart, Apple crumble, Apple lime cake, American Apple pie cake and other regular flavors. You will find them all very easily here, which may not be possible at the local bakery shop near you. In India it is a tradition to have sweets on special occasions, like buying a new vehicle, and festivals. Distributing sweets is a way to express gratitude and affection towards people we value in life. Keeping this in mind awesomeji.com is trying to reach out to people with its assortment of sweets. Sweets like Laddoos, Mohan Thal, Pedas, Pinnis of different types, Mysore Pak, Imarti, Mango Firni, Barfis are all readily available for you online. You can also go for different types of Halwas like Karachi Halwa, Badam Halwa, Orange Ice Halwa, Rose Ice Halwa, Anjeer Halwa and many more types. Those worried about calories and sugar can relax as sugar free sweets are also available. Many times our loved ones living in foreign countries crave for Indian sweets but that is no longer a problem as sweets can be shipped to foreign destinations of Canada, U.K, U.S, U.A.E and Australia through awesomeji.com. You can also smoothen out all the resentment in your relationships by exchanging sweets and chocolates. Gifts that can be passed on from one person to the other have greater value and continue to be treasured and valued for may be generations. A few such gifts that you can pick from our site include brass and other metal artifacts, jewelry, home décor items, showpieces, photo paintings, and metal God idols and photo paintings. The metal articles that you can choose from include bangles set, card holder, jewelry tree, mango tea lights, golden metal rose in a box, black metal red lamp, diamond metal T-lite, adorned metal bowls, Silver plated serving bowls, pooja thalis, showpieces, silver plated food dishes. If you choose a Ravi Varma photo painting or Tanjore painting you will gift your loved one a unique piece of art and also add beauty to the walls. Owning such a piece of art will also make your loved one feel very proud. Add that extra zing to your celebration by ordering a bouquet of flowers, teddy bear, and greeting card alongside the gift that you select. The best part is awesomeji.com offers midnight delivery and same day delivery on flowers and cakes and free shipping on all articles. You can rest assured that you will get good quality. Not only that, if wine is your favorite drink, you can gift your loved one some time that you will spend together drinking wine and having cookies or chocolates. The portal offers a bottle of wine with flowers and cookies for you to gift. The Antique Black Royal Wine Set made of pure brass and a wine cooler available on awesomeji.com will make you rock. Awesomeji.com has its presence in the city of Mumbai and its nearby areas. You can send gifts to Lonavala, Matheran, Nasik, Alibaug, Diu, Lavassa, Panvel, Silvassa, Igatpuri, Kihim, Trimbakeshwar and many more. Awesomeji.com also covers international destinations of Canada, U.K, U.S, U.A.E and Australia. Gifts can be sent to these countries from India and from these destinations to India also. 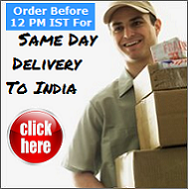 Now send gifts/presents to Mumbai (India) and get free online delivery. Buy/order presents like flowers, cakes and sweets and get them delivered at cheap and discounted rates to Mumbai.